BEST ANSWER: Thank you for your inquiry. Yes, the Eurocave 3181 can be built in if you leave clearance on the top, bottom and back giving the Eurocave the ability to ventilate and breath as it's a rear venting unit with coils in the rear of the unit. If you have any other questions, please feel to reach out to us at 800 356 8466. Thank you again. The product will require a few inches of clearance to allow for proper ventilation. are the shelfs in this unit the same as in the euro pro dule zone?? I am not sure which cellar the "Euro Pro dule zone" you are referring to? This 5290 wine cellar is a dual zone. Almost all current full size Eurocave wine cellars have the same style shelving in them. Feel free to reach me directly to confirm @ 1-800-356-8466 ext 5106.
they are wood shelves. I believe them to be the same. does the Pro 3181 have rolling shelves or slide out? the specs say rolling shelves, a review said sliding shelves. which is it? BEST ANSWER: Yes, these shelves are rolling. They use guide rails and wheels. The shelves are rolling shelves. Is there a humidity control mechanism for this unit? BEST ANSWER: The 3181 Professional will maintain humidity at a proper level within the 60-80% range. Yes this does control the humidity. Is this manufactured by Eurocave or Transtherm (I believe owned by Eurocave). And if Transtherm, are there any differences between a Eurocave and Trnastherm units in terms of quality, materials, etc? 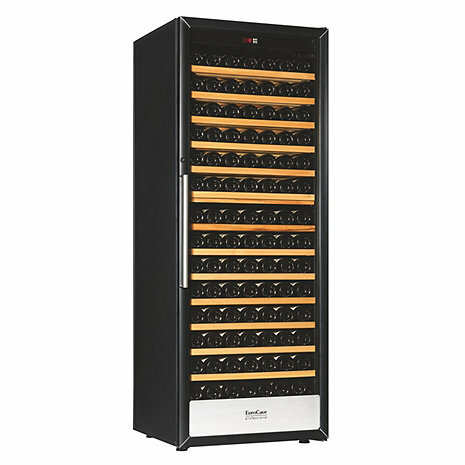 BEST ANSWER: Hi Thank you for your inquiry, this wine cellar is a Eurocave product manufactured by Eurocave in France. BEST ANSWER: The Eurocave 3181 has a 12-16 week lead time. Are the included shelves actually rolling or are they non-rolling (easy-glide)? BEST ANSWER: There are 13 rolling shelves. Can the unit be ordered right hand hinged, and is it quiet? Is the hinge able to switch to be on the Left in the field or does it have to be ordered on the left from the start? BEST ANSWER: Thank you for your question. The Professional edition of Eurocave only comes right hinged and cannot be flipped in the field. If you have further questions please call us at 1-800-377-3330. What is the spacing between the shelves of the EC Professional 3181?? Will it hold California Sparkling-wide bottles? How many charcoal filters are on this unit? how often should they be replaced? Are there any different shelves which can be used with this unit? When storing predominantly Burgundy bottles, I find the layout of these shelves problematic and would prefer to avoid beveling them out myself. Thank you.